Our 2nd annual fall conference for KNIME Users and Enthusiasts takes place on November 1-3, 2017 in Austin, Texas! We have invited some of the world’s leading data scientists to speak about their use of KNIME software to solve complex data problems in areas including the life sciences, manufacturing, marketing, retail sales, and many others. 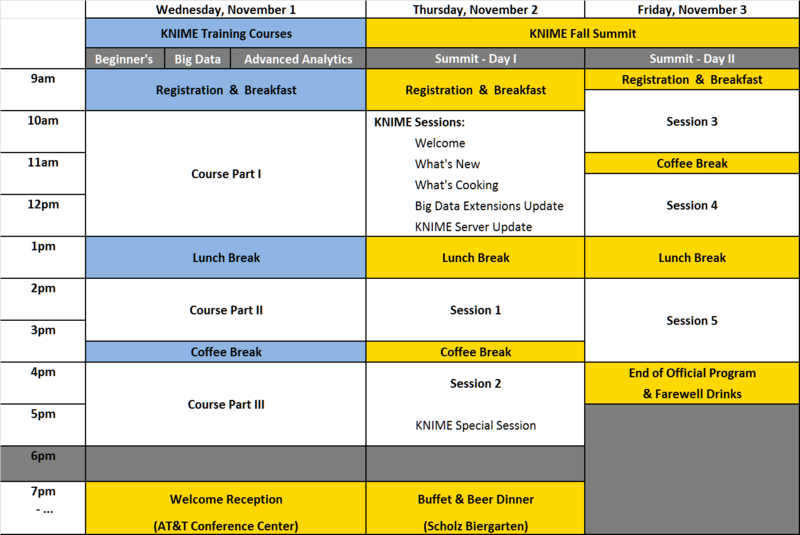 The KNIME Fall Summit 2017 will be held near downtown Austin at the AT&T Executive Education and Conference Center. For the second time, we are hosting our signature event in the US, bringing together KNIME users, the KNIME community and partners, and those interested in learning more about KNIME. We will start with a day of training courses on Wednesday, November 1 followed by two Summit days (Thursday/Friday, November 2+3). Grab the opportunity to meet with many of the people behind KNIME who will be talking about new and upcoming features of KNIME software. Mingle with fellow KNIME users and the KNIME community and listen to their presentations about how they use KNIME Analytics Platform in a wealth of different application areas. And, as usual, there will be plenty of time during coffee and lunch breaks and drinks at the end of each day for discussions on and around modern analytics. Course 1 – KNIME User Course: This one day course is an intensive program designed to provide supervised experience tackling the common tasks you will face in your future analytics work. Learn how to import data from a variety of sources, build, evaluate and select models, visualize results, and generate reports. Course 2 – KNIME Big Data Course: This one day course focuses on processing and mining databases with Hadoop and Spark through KNIME by using the KNIME Big Data Extensions. Learn how to interact with these tools through hands-on examples during the course. Course 3 – Advanced Analytics Methods, Stefan Weingaertner (AdvancedAnalytics.Academy): This one day course provides an introduction to the most important methodologies, algorithms and ideas in the data scientist's toolbox. Learn how to uncover underlying patterns or concepts in large datasets, group objects into meaningful clusters, classify objects into predefined categories and refine feathres to enrich predictive modeling endeavors. Want to learn more about our Summits? Check out our recent KNIME Spring Summit 2017 in Berlin & KNIME Fall Summit 2016 in San Francisco and see the slides and videos from the conference. KNIME Deep Dive: "Deep Learning (and some Images)"
The KNIME Fall Summit will be held in Austin at the AT&T Executive Education and Conference Center. We have secured a special price for a contingent of rooms at the AT&T Center. Please make your reservations early before the hotel fills up. Use this link (or group reservation code KNIMEM1117) to get the KNIME Summit rate. What are the KNIME Summits? The KNIME Summits started as an annual Users General Meeting (UGM) in Zurich, Switzerland inviting users of the KNIME Analytics Platform to demonstrate and talk about how they apply this powerful data analytics tool. Year by year, the conference has grown, moving to larger venues in 2015 in Berlin, Germany. 2016 and 2017 saw the renaming of the conference to the KNIME Spring Summit and the announcement that the KNIME Summits would be held twice a year – in Spring and in the Fall – in Europe and the US. Our goal is to invite thought leaders from the inter-disciplinary fields in which KNIME Analytics Platform is used and to bring together the KNIME community of practitioners and researchers working in modern, advanced data analytics.